DISCONTINUED. 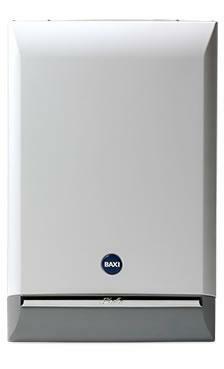 The Baxi Solo 15 HE A is a compact relatively lightweight wall mounted heat only condensing gas boiler. Hot water is provided by way of a separate storage cylinder. With a SEDBUK efficiency rating of 89.2% one of its main advantages is its compactness. Measuring 60x39x30cm the boiler is made to fit inside most standard kitchen cupboards and weighs just 26kg. It's an ideal choice if space is of a premium. The Baxi Solo 15 HE A is suitable for homes with a low heating demand such as a two-bedroom house. Medium to large size homes with higher heat demand should opt for a larger output 18-30kW models are also available. Recommended by the Energy Saving Trust basic features include a reset switch and temperature control for the central heating. As with most boilers you'll need to fit additional thermostatic radiator values and a room thermostat to ensure it operates efficiently. The Baxi Solo 15 HE A is a compact relatively lightweight wall mounted heat only condensing gas boiler. Hot water is provided by way of a separate storage cylinder. Had mine installed for about 5 years, all has been OK until 21/01/18 when it's now developed the same leak that others have posted in various websites. Clean hot water leaking from around the the water over flow pipe at the bottom of the boiler. Plus also had to reset the boiler 6 times on the same date. Its a housing association property, so luckily for me no personal cost to me. It's had multiple low pressure problems over these years as well. Had this boiler fitted under the Governments energy saving incentive by NPower at no cost to me, the installation was completed on 30/11/2015 it ran without fault all that winter into end April 2016 I did not put the heating on again until end October 2016 it ran fine up until 06/01/2017 , so 7 months working fine, it has now developed a leak, clean clear water dripping from the base of the boiler casing , I live on the south coast it has not been subject to minus temperatures, it's out of warranty because of time, 12 months from installation at 13 and bit months. I accept it cost me nothing, but is this the quality of our manufacturing in the UK to day? I had a glowworm before they said it was very inefficient, but it worked for 14 years with just a replacement fan needed., this Baxi hasn't lasted 14 months.